PRESENCE, POWER AND PERSONAL STYLE WRAPPED IN A WORLD-CLASS DESIGN THAT REDEFINES THE LONG-HOOD CONVENTIONAL. Kenworth’s long-hood conventional is the enduring symbol of American trucking — a perfect fusion of power, luxury, craftsmanship and traditional styling. For most professional drivers, it also represents the ultimate reward, a uniquely personal icon that stands for their dedication, achievement and sense of pride. Through the decades, our job has been to carefully — and continually — refine this classic without changing what made it great. Introducing the Kenworth W990, the truck for those who put a premium on making a personal statement. It comes with uncompromising styling, straight ahead performance, premium finishes and lifestyle amenities that put you way ahead of the pack. It just doesn’t get any better than this. For those who accept nothing less than having it all, there is the Kenworth W990 Limited Edition. 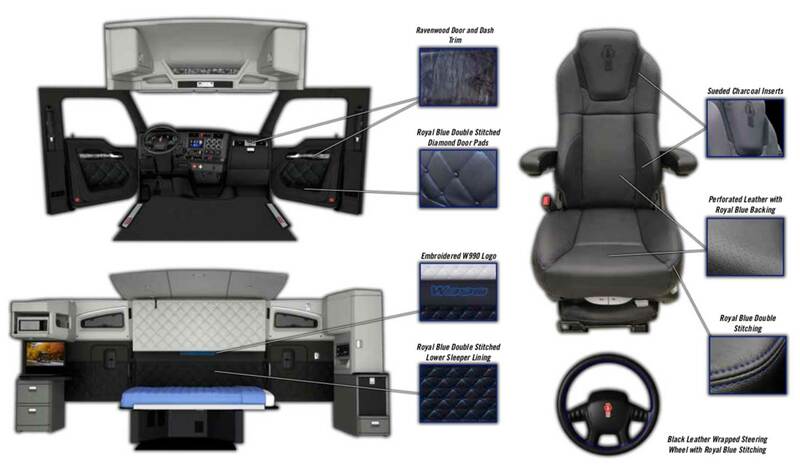 Rich black leather, Ravenwood accents and Royal Blue double stitched diamonds combine to create a dramatic environment of unsurpassed comfort and convenience. Where space, elegant design, fine craftsmanship and an abundance of quality details define your surroundings. To drive a truck efficiently, drivers must track fuel, vehicle and safety systems performance on the go. But good information isn’t the only thing the Kenworth Driver Performance Center offers. The quality, clarity and visual in real-time presentation also means a lot when you’re focused on the road. The 5-inch full color, high resolution screen is an industry first. At a glance, it tells you everything you need to know about operating in the sweet spot between performance and efficiency. 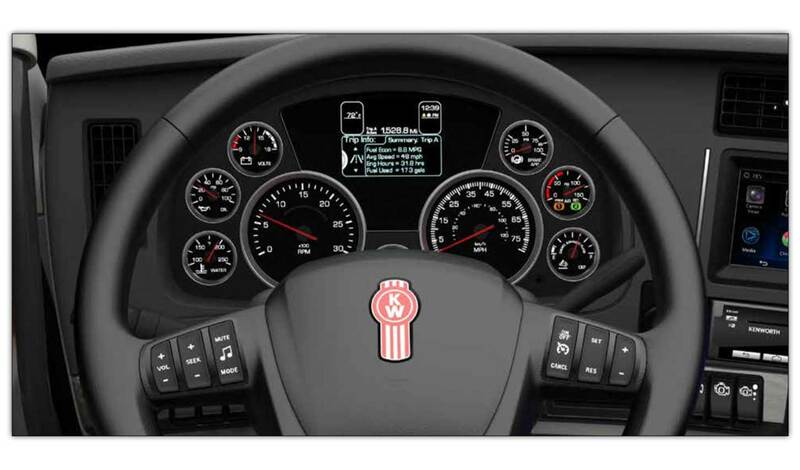 Truck diagnostics and performance indicators pop up to alert the driver. Trip details and multi- route comparisons allow them to maximize performance every day. NAV+ HD is an in-dash display designed specifically for life on the road. Consider it your personal assistant. 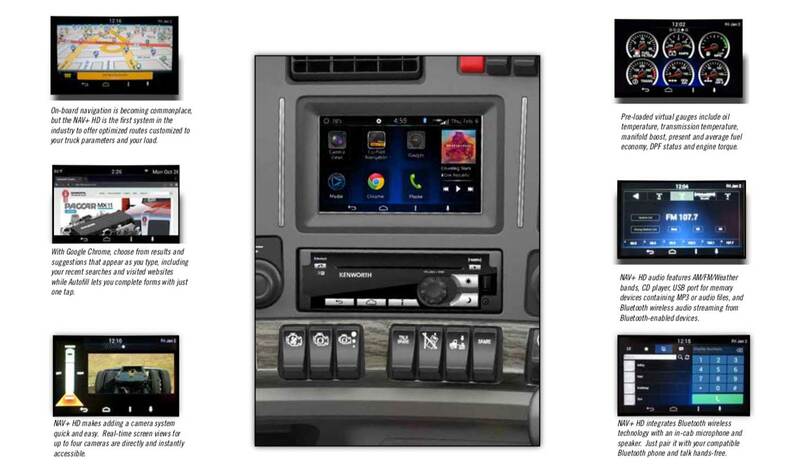 With a simple touch to the high-resolution 7-inch color screen – or a spoken command – you have direct access to a full range of valuable and productive features: Truck-specific navigation, roadside assistance, vehicle data, hands-free calling, audio controls (including satellite radio, AM/FM/CD/MP3/ USB/Bluetooth), blind-spot camera inputs and the internet. NAV+ HD. Enjoy the road. ACCELERATE DIAGNOSTICS. EXPEDITE REPAIRS. STREAMLINE COMMUNICATIONS. It’s been shown that up to 80 percent of every service event consists of poor or slow communications and processes — lost time, effort and assets that could be better utilized moving your business ahead. Introducing KENWORTH TruckTech+ Remote Diagnostics and Service Management, a revolutionary, fully integrated system designed to streamline every aspect of fleet maintenance. The benefits of TruckTech+ begin before your vehicle ever enters the service bay. Kenworth’s innovative remote diagnostics technology helps you diagnose and solve potential problems — before they impact your operation. Immediate and simple recommended actions are provided to the operator through the Kenworth Driver Performance Center. 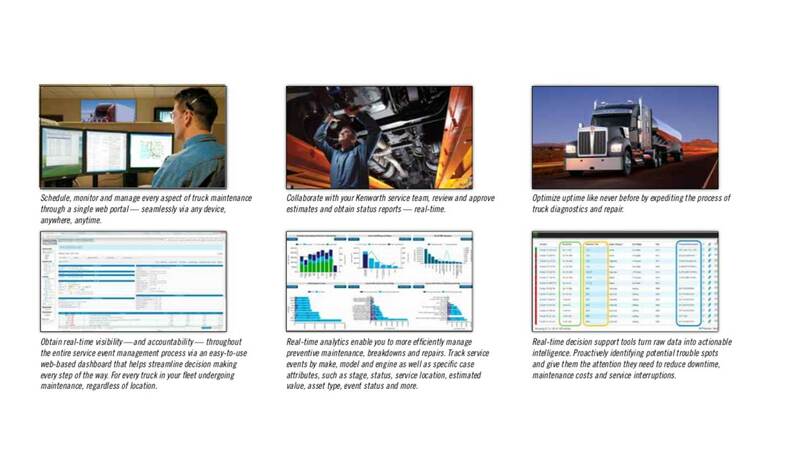 Once in the shop, PACCAR’s proprietary “diagnostic reasoning” engine helps technicians accelerate fault guidance and diagnostics — the first time. MAXIMIZE UPTIME AND MINIMIZE THE TRUE COST OF MAINTENANCE. Much of the downtime associated with truck maintenance can be spent looking up details on a vehicle, leaving messages, returning phone calls, filling out forms, submitting estimates and waiting for approvals. If you want to increase uptime and utilization, reduce the management of service events and trim the true cost of maintenance, you need a system that can help you communicate better information faster and more efficiently. 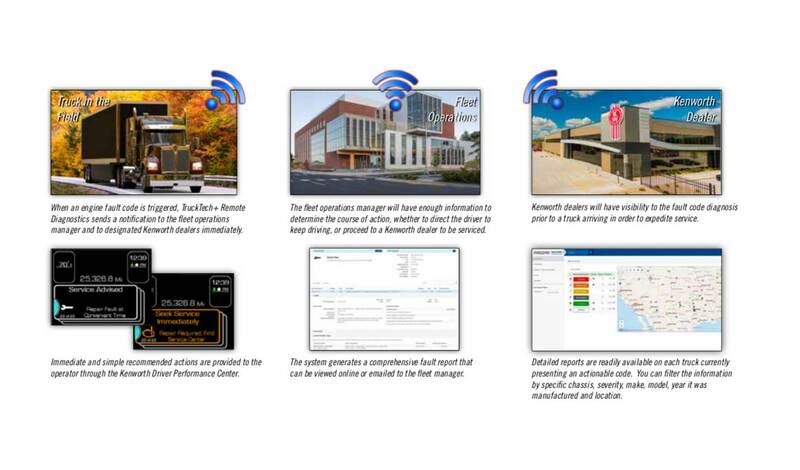 Anytime, anywhere on any device (desktop, laptop, tablet and smartphone) in real time. Welcome to the TruckTech+ Service Management System — a smart, easy-to-use, web-based tool that lets you do in minutes what used to take hours. • Centralizes and makes easily accessible all asset information – build, service history, warranty and product updates.